Sunny weather and dry – speeds corn growth and makes peanut thrips bad. Corn Tasseling in several fields now. Very little disease seen. 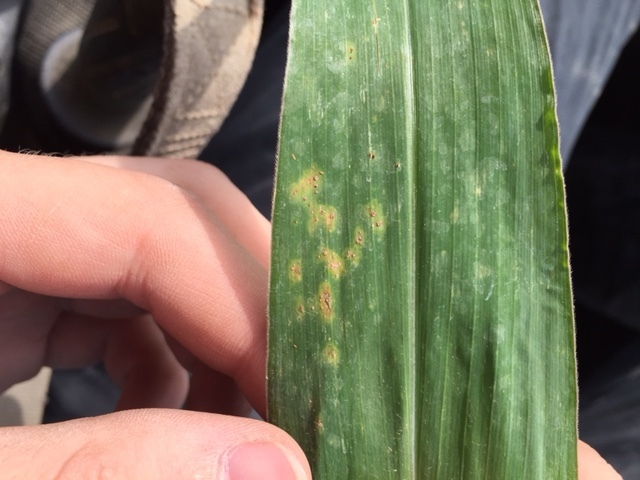 We saw a spot or 2 of NCLB but no Southern rust. We did see some of the common rust but it’s no problem. A few stink bugs seen in some spots but not many anywhere. Thrips are terrible in peanuts and several fields had to be sprayed, even some that had Thimet under them. The weird thing about thrips damage is when you see the leaf damage….. it’s too late. In other words, unless the plants are carefully scouted for thrips you can’t really tell they are working excessively, but a week later we see the damage. The good thing is peanuts are tough and can stand a lot. We are seeing a little Aspergillis crown rot in some peanuts. It’s worse when it’s hot and dry. Watering will help this problem. 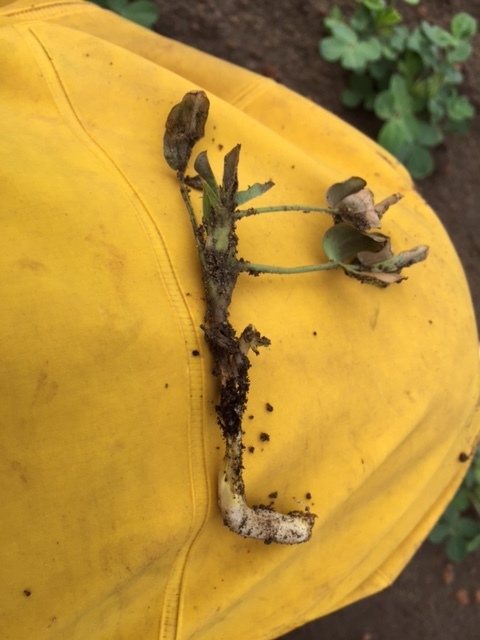 We have seen a few stand problems, too… rotting seed. 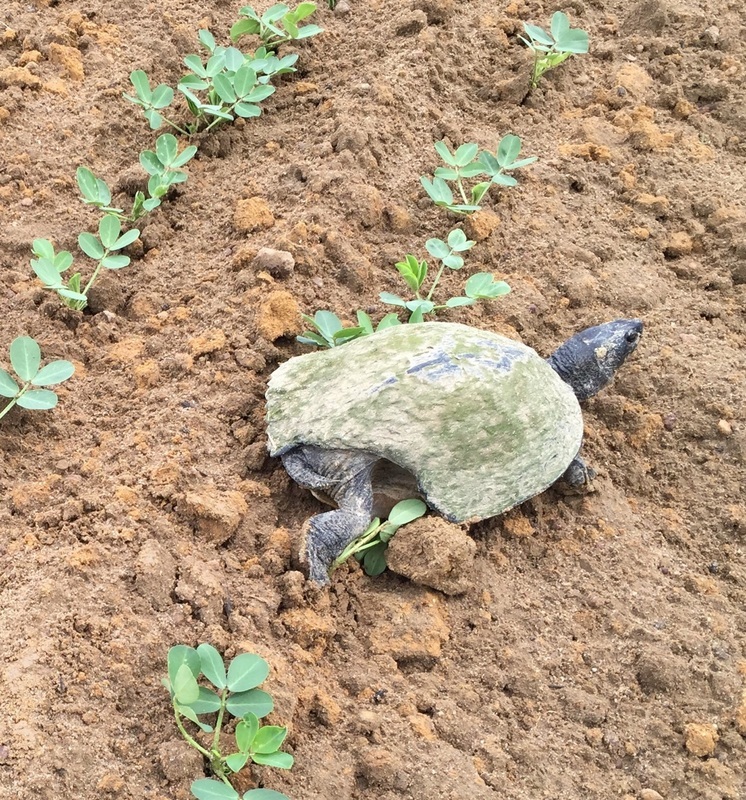 I’d never seen a turtle like this before, he was getting around just fine in the middle of a 100 acre peanut field, why… I don’t know. Did he get Gator bit? Tassel stage is referred to as VT. And soon after we go to R1, (Reproductive stage 1) when the silks emerge from the little ears and the pollen starts falling from the tassels. The greatest production of pollen from a field will occur over 4 days, with some pollen shedding for a week or more. Over 2 million pollen grains fall from each tassel. Peak pollen shed is mid morning and then towards late afternoon more falls, but if it’s raining or a heavy dew the plant won’t shed pollen until it dries. Also, some research shows that when the temperature goes above 86 degrees there isn’t much shed. If it’s cloudy and slightly cool, pollen may fall most of the day. Extreme heat (100 degrees) can kill some of the pollen. 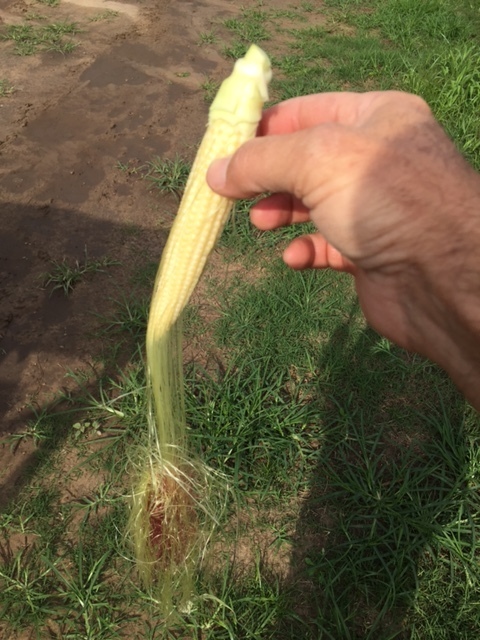 Corn near Lela this week…. This is a very critical time in corn development and we don’t want any stress on the plants. 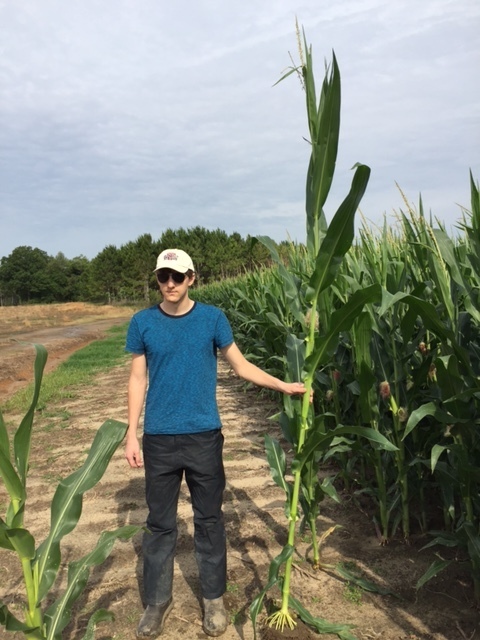 Stress during silking can reduce the number of kernels per ear, not the number of rows (that was decided a while back), but the number of kernels extending out on the cob. 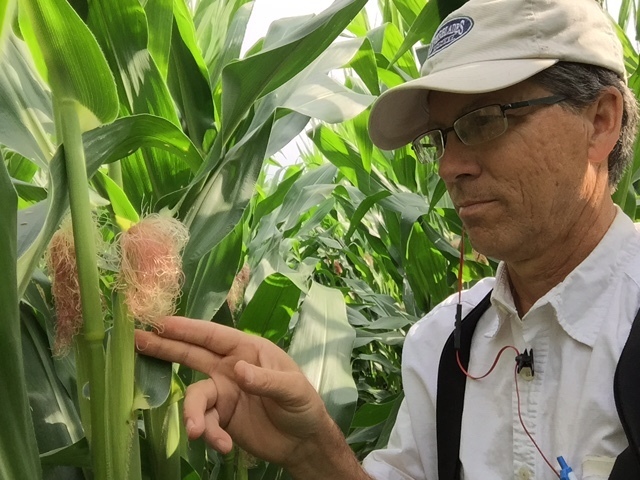 Getting pollen shed and silking synchronized is important for high yields. Plants that came up later likely won’t get pollinated well. Other stresses like nematode spots or leached sandy spots, or overly wet spots that may be slightly behind in silking can have problems, too. Silks are receptive to pollen for at least 5 days after coming out, they feel a little sticky. It’s amazing to me how each silk gets a pollen grain that travels to each kernel. What a miracle God does every time. The first silks come from the base of the ear. If the silks coming from the top of the ear come out too late they won’t get pollinated. The corn ear has 700 to 1,000 potential kernels and usually only 450 to 550 are expected to make it. We saw this common rust this week, it’s cousin, Southern Rust is real bad but common isn’t. 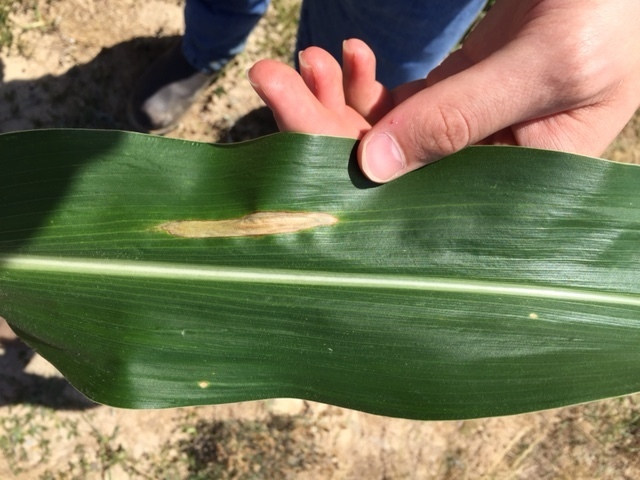 Seen only a spot or 2 of Northern corn leaf blight this year. Good news as we sometimes have to spray corn early if it comes on. My son Jesse, who is helping me found this, this week. This entry was posted on May 20, 2016 at 9:18 am	and is filed under Corn. You can follow any responses to this entry through the RSS 2.0 feed. You can leave a response, or trackback from your own site.